^ 1.0 1.1 Freedman, R. A.; Kaufmann III, W. J. Universe. New York, USA: W. H. Freeman and Co. 2008: 762. ISBN 978-0-7167-8584-2. 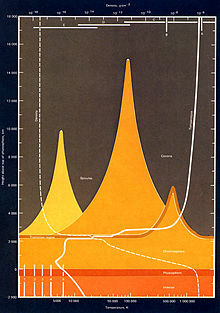 ^ 3.0 3.1 SP-402 A New Sun: The Solar Results From Skylab. （原始内容存档于2004-11-18）. 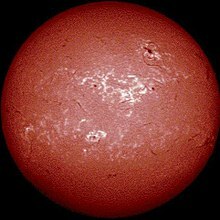 ^ Carlsson, M., Judge, P., Wilhelm, K. SUMER Observations Confirm the Dynamic Nature of the Quiet Solar Outer Atmosphere: The Internetwork Chromosphere. The Astrophysical Journal. 1997, 486: L63. Bibcode:1997ApJ...486L..63C. doi:10.1086/310836. ^ De Forest, C.E. High-Frequency Waves Detected in the Solar Atmosphere. The Astrophysical Journal. 2004, 617: L89. Bibcode:2004ApJ...617L..89D. doi:10.1086/427181. ^ Foukal, P.V. The pressure and energy balance of the cool corona over sunspots. The Astrophysical Journal. 1976, 210: 575. Bibcode:1976ApJ...210..575F. doi:10.1086/154862. Animated explanation of the Chromosphere (and Transition Region) (University of South Wales). Animated explanation of the temperature of the Chromosphere (and Transition Region)[永久失效連結] (University of South Wales).